One of the butcher’s shops in my town has recently been advertising wild rabbits, at £4.50 per kilo. I have eaten rabbit before but hadn’t cooked it, so decided to give it a go. Now I know that Brits often get squeamish about eating rabbits, primarily because they’re cute and fluffy and people keep them as pets. I, on the other hand, have no such qualms. Rabbit meat is high in protein and iron, but low in calories and fat. Rabbits breed prolifically, and are considered to be a major pest by farmers. Eating wild rabbit is therefore beneficial to the farming community. In terms of taste, rabbit is (clichéd as this may sound) very similar to chicken. Because it is very lean, it benefits from being paired with a rich sauce. I made mine from home-made chicken stock which was enriched with bacon from one of A Man’s dad’s pigs – there was about an inch of fat under the rind. And in case you think I’m heartless and cruel, you may like to know that I kept pet rabbits from the ages of 5 to 20. I loved them to bits and (unless my parents have been keeping secrets from me for the past 15 or so years) didn’t eat any of them. I don’t see this as being at odds with a willingness to chow down on their wild cousins. As far as I’m concerned, it’s important not to detach yourself from the source of your food and not to be sentimental about certain types of meat, while happily gorging yourself on others. Has anyone else got any good rabbit recipes for me? I put half of it (along with the liver) in the freezer. Chop the bacon into chunks and fry on a low heat to render the fat out. Remove the pieces of bacon from the pan and reserve. 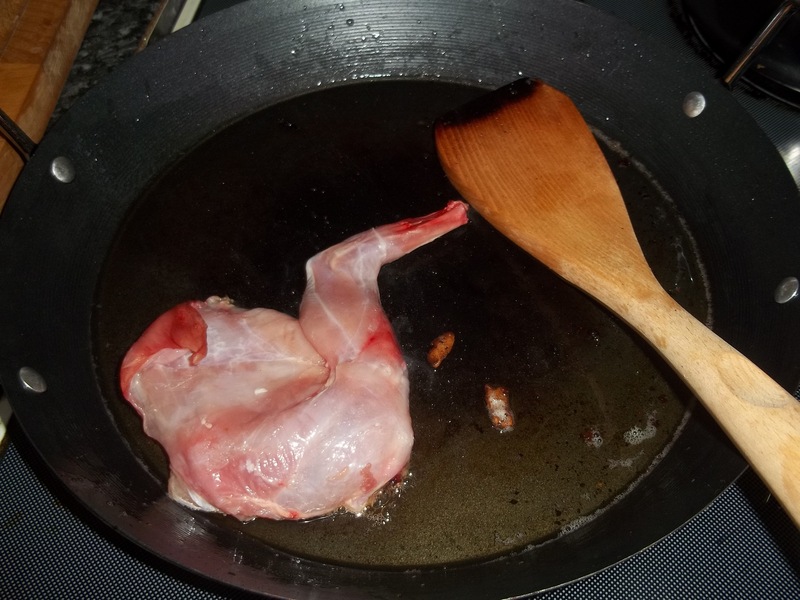 Brown the rabbit in the fat for a couple of minutes and remove from the pan. Dice the onion and fry in the bacon fat. Add the thyme, dice the parsnips and mushrooms and fry off until the veg is starting to soften. Add the bacon and rabbit back into the pan and pour over the stock. Cover and cook on a very low heat for about an hour. Mix a spoonful of cornflour with cold water. Remove the rabbit from the pan and keep warm. Add the cornflour to the stock and stir continuously until the sauce has thickened. 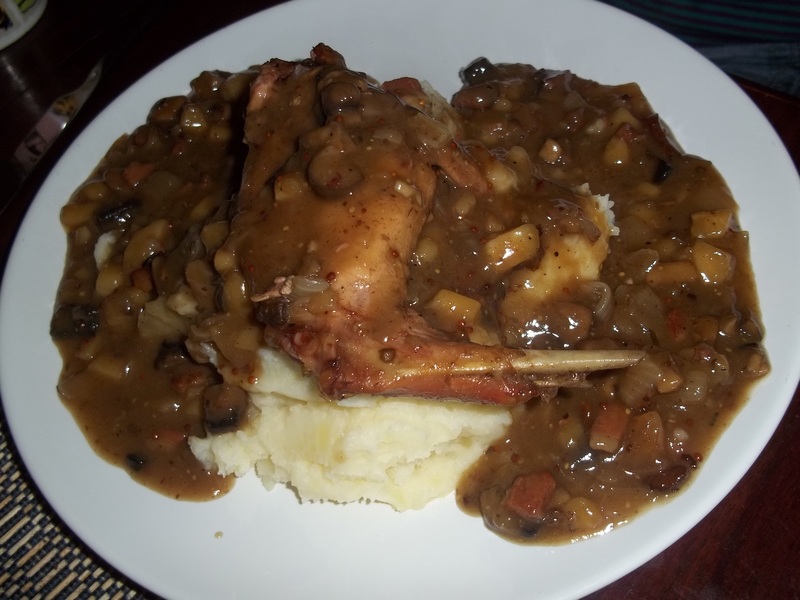 Serve the rabbit immediately on top of a mountain of mashed potato and covered with the sauce.